Whatever it is, it certainly is interesting. What's the scale on the pic? 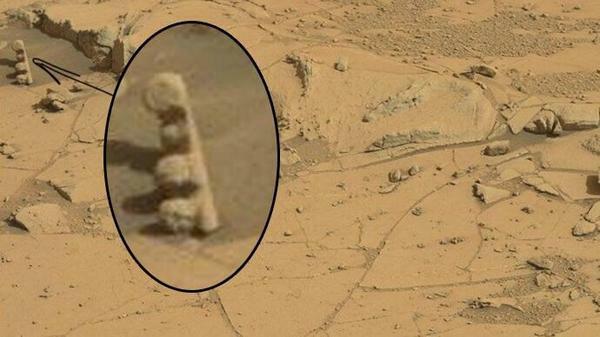 Wonder if it was taken on the surface of Mars at all, or another likely Earth picture? In which case it could be a hardened exposed burrow for some critter that lives in the sand or something. Some of the 'Mars' pics that have suspicious colourings from the 1976 Viking mission (another improbable technical success from that era, like Apollo) look a lot like Earth deserts with some quick tweaks to the colour saturation -- the kind of tweak that could have been performed using old photographic methods and filters etc in the 70s. The question remains as to how many of the current missions have faked pics on Earth and how many actually successfully landed and started taking real snaps.